The Battle of Short Hills was also known as the Battle of Metuchen Meetinghouse and other names. was a conflict between a Continental Army force commanded by Brigadier General William Alexander ("Lord Stirling"), and an opposing British force commanded by Lieutenant General William Howe. The battle took place at Scotch Plains and Metuchen, New Jersey. 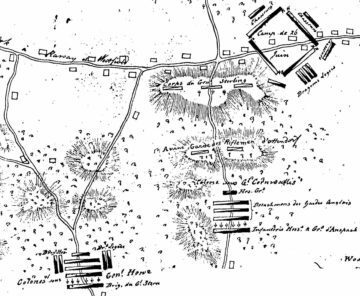 Despite the name, no fighting occurred in modern-day Short Hills, a section of Millburn. 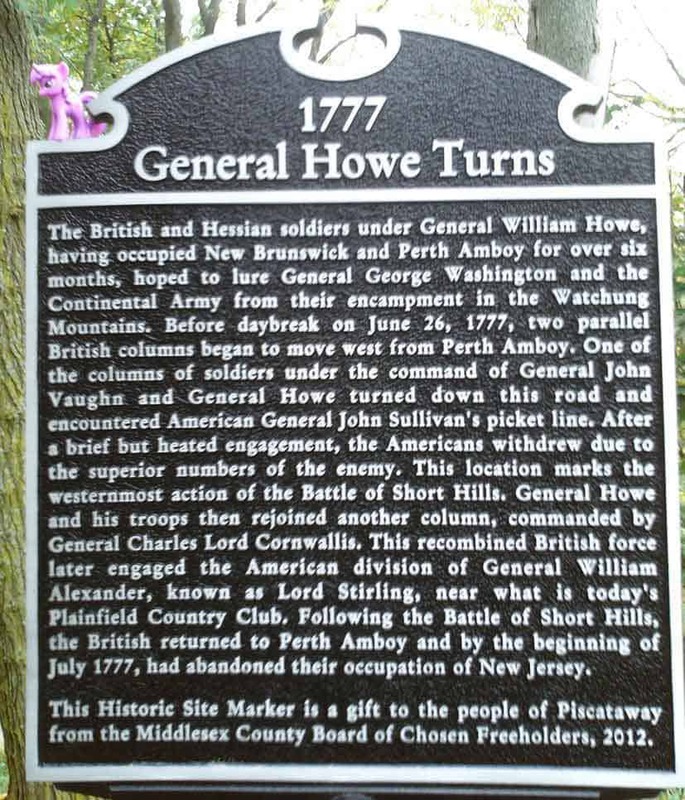 In mid-June, Howe marched most of his army into central New Jersey in an attempt to lure General George Washington's Continental Army to a place where it might be better attacked than its defensive position in the Watchung Mountains. When Washington refused to abandon his position Howe returned to Amboy on June 22. Washington's forward divisions, including that of Lord Stirling, shadowed this British movement, and Washington moved his main army out of the hills. Howe seized on this opportunity. On June 26, Howe marched two columns of troops out in an attempt to cut Washington off from the high ground. These troops skirmished with Lord Stirling's troops, and eventually engaged in a pitched battle in Scotch Plains. Stirling's outnumbered force retreated, but Washington, alerted to the British movement, had by then retreated back into the hills. Armies - American Forces was commanded by Brig. Gen. William Alexander (Lord Sterling) and consisted of about 2,200 Soldiers. British Forces was commanded by Gen. Charles Cornwallis and consisted of about 16,000 Soldiers. Casualties - American casualties were estimated to be 12 killed, 50 wounded, and 50 missing/captured. British casualties was approximately 70 killed or wounded. Outcome - The result of the battle was a tactical British victory but also a strategic American victory. The battle was part of the Philadelphia Campaign 1777-78. On June 9, Howe began moving troops from Staten Island to Perth Amboy. 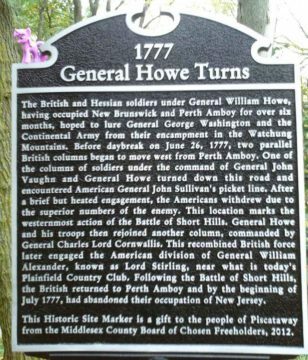 On June 11, almost Howe's entire army had moved up the roads along the Raritan River to New Brunswick. Washington's intelligence reports indicated that Howe had left behind equipment needed for crossing the Delaware River and was unlikely to be heading for Philadelphia. Washington, as a precautionary measure, called out the militia in southern New Jersey. On June 14, Howe's army marched again, its destination Somerset Court House (present-day Millstone). Apparently seeking to draw Washington into battle on open terrain, Howe remained there for five days. Washington refused to move out of the hills. On June 19, Howe began the march back to Perth Amboy, which he reached three days later, having completely evacuated New Brunswick. 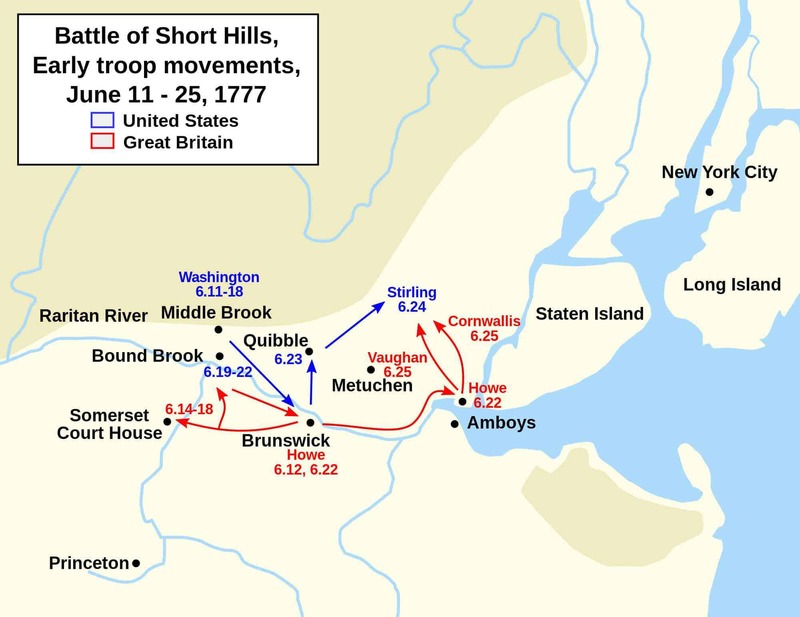 After refusing to fall for Howe's trap, Washington followed the retreating British, bringing his army down from Middlebrook to Quibbletown, and sent a strong forward detachment, under Lord Stirling, to the Scotch Plains area north of New Brunswick, to cover his left flank and to harass the British. Stirling's command, numbering about 2,500 men. Howe took advantage of Washington's movement, and launched a sudden attack against Lord Stirling's position, meant to devastate Stirling's forces, cut off Washington's retreat back to Middlebrook, and engage the Americans in a pitched battle on relatively open terrain. 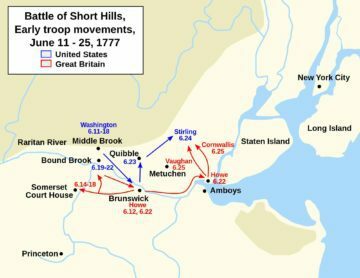 On June 26, at 1:00 AM, Howe marched two columns of troops out of Perth Amboy. The first column was under the command of Lieutenant General Charles Cornwallis. The second column was under the command of Major General John Vaughan and was accompanied by Howe. The column of Cornwallis men marched for Woodbridge, while Vaughan's men marched toward Bonhamton. As the two columns moved on roughly parallel paths through the Short Hills area, they came into contact with Lord Stirling's guards, and a running skirmish began, with the Americans firing on the British from the underbrush as they fell back. The retreating Americans lead both of the armies into the Ash Swamp and Scotch Plains areas, where Stirling prepared a defensive position. Severe cannon fire and strength of British numbers forced Stirling to retreat toward Westfield. There, the British, suffering from the day's extreme heat, ended the pursuit. Lord Stirling was able to fall back in good order toward the post at Middlebrook. 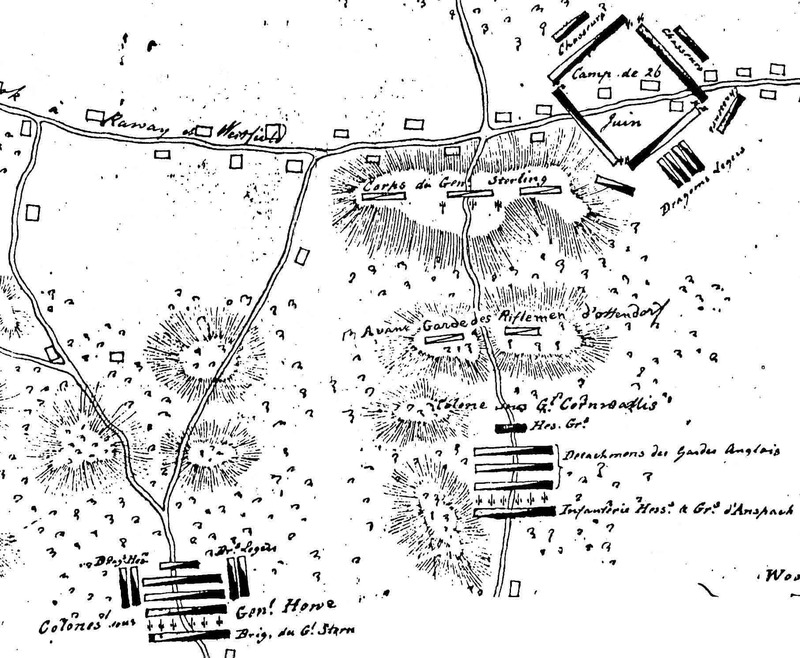 A messenger had alerted Washington to Howe's proximity, prompting Washington to precipitately withdraw to a more secure position further in the hills. Later in the day, Howe arrived to inspect Washington's lines and adjudged them too strong to attack. Because Lord Stirling's resistance may have provided Washington with enough time to manage his withdrawal to more secure ground, the battle is considered a strategic victory for the Americans. The British, after spending the night at Westfield, returned to their post at Perth Amboy. By June 30, the British had completely evacuated New Jersey. In mid-July, Howe embarked much of his army on transports, and sailed off toward Philadelphia, destination unknown to Washington.